Goal: Teach your teen to drive safely and with confidence on busier, more complex, multi-lane roads. Location: A busier, multi-lane road. Choose a time with limited traffic, such as a weekend morning. By now, your teen should be comfortable driving on quiet roads. Before starting multi-lane road practice, it’s important to review some key information from previous lessons. The following skills are crucial to safe driving on busier, more complicated roads. Refer to Skills one and two. Clearly seeing the adjacent traffic is especially important on multi-lane roads. Remind your teen to check the mirror positions when entering the car, and to constantly monitor the traffic around them. Refer to Skill six. Remind your teen that when stopping their vehicle behind another one, they should be far enough back to see where the other car’s tires meet the road. Refer to Skill six. Review the three-second rule with your teen, emphasizing that increasing following distance is the single best way to reduce crash risk. This gives the driver visibility, time, and space to avoid crashes. When changing lanes, always recheck traffic with a glance over the shoulder at the blind spot. First, coach your teen not to change lanes unnecessarily. Studies show that while it may not look like it, most travel lanes flow at around the same rate. Changing lanes in an effort to save time doesn’t actually save time, but it does increase crash risk. Ask your teen to list valid reasons to change lanes. Good answers include: to make a turn, to avoid an obstacle, to exit the road, to park, or to pass another vehicle. Check traffic to the rear and the sides for an appropriate gap. Signal to indicate intention to change lanes. 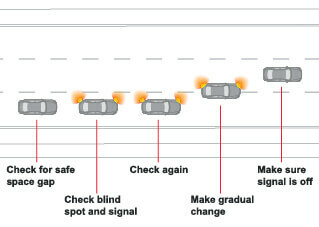 Recheck traffic, including a glance over the shoulder at the mirror blind spot area. Maintain speed or accelerate slightly before and during the lane change. Gradually move into the new lane. Adjust following distance using the three-second rule. Motorcycles, bicyclists, and pedestrians are more difficult to see than cars because they are smaller – and drivers tend to focus on looking only for cars. Traffic, weather, and road conditions require cyclists to react differently than car drivers. It can be difficult for young drivers to judge and predict their actions. Always give motorcyclists and bicyclists a wide berth. Start with right turns, which are fairly simple. Right turns are always made from the right lane of the current road to the first, open lane of the new road. Look for signs and signals that indicate whether “right on red” is allowed. Practice right turns 10–12 times before moving on to left turns. Don’t turn the wheel until you’re ready to make the turn. Protected left turns should be made from the designated lane when the left turn signal displays a green arrow, using the yellow line in the lane being turned into as the steering target. Make sure the vehicle is in the correct lane to make a left turn. Signal the turn and begin slowing down at least 100 feet from the intersection. Move carefully into the intersection. Don’t turn the wheel until you’re ready to make the turn. Yield to any vehicles, cyclists, or pedestrians. When there is sufficient space with no oncoming traffic, move ahead into the turn. Choose a steering path line in the middle of the closest lane to the right of the yellow line. Position your vehicle more than three seconds behind the vehicle to be passed. Check mirrors and blind spots for oncoming traffic. Check the passing lane ahead to make sure there’s plenty of space before you try to pass. Signal intent to pass and accelerate quickly to match the speed of traffic flow. While passing, monitor the space in front of and behind your vehicle and check the rearview mirror for the front of the car being passed. When you see the front of the passed car in the rearview mirror and your vehicle is well clear, signal intent, gently and slowly move back to the original lane, cancel the signal, and maintain speed. Left turns are one of the hardest maneuvers for teens to master. Be patient. New drivers often have difficulty judging the speed and distances of multiple lanes of oncoming traffic. Have them practice judging oncoming vehicles’ distance from your vehicle by counting out loud the time it takes for an oncoming vehicle to reach your car from a designated point.